As LA Unified is currently laying off hundreds of teachers and other employees to deal with a looming budget crisis, there is perhaps one piece of good news for any teacher getting a pink slip: it has become an “employees’ market” for teachers in the state. Due to a growing shortage, many large districts are struggling to hire enough qualified teachers. 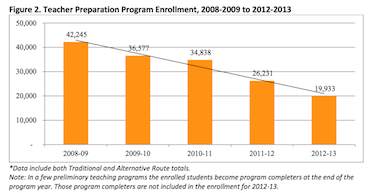 The shortage is due in part to the number of students enrolled in teacher preparation programs in the state being cut in half from 2008 to 2013. The stark numbers were cited in an October report by the California Commission on Teacher Credentialing. In 2008, when the recession hit and thousands of teacher began getting laid off in the state, there were over 42,000 students studying to become teachers. By 2013, the number was down to 19,933, the data shows. The inclination is to think that there are thousands of teachers who were let go during the recession and who are ready and willing to fill these jobs. Unfortunately, few younger, less-experienced teachers hung around after seeing their jobs disappear; many chose different careers. The shortage has led other districts like San Francisco Unified to struggle to hire enough teachers. Substitute teachers are in high demand as a result of the shortage. One sub told the Sacramento Bee that he recently received 15 requests to work San Juan Unified School District classrooms on a Friday. “Tuition fees at state colleges and universities could be waived for the fifth year of teacher preparation education for students who successfully complete the program and secure employment in a California public school,” Herrington wrote.